Firmware version 1-69 for TM3-Primus released: The new update includes further improvements and is available for download in "Audio Monitors/TM3-Primus" section at members area (Manuals & Software). RTW‘s TM3-Primus series units are a highly compact and innovative, easy-to-use products, giving music, voice, and multimedia producers in professional as well as non-commercial environments everything they need. Therefore, the loudness and audio metering devices include frequently used standard instruments and parameters in supreme quality to meet the demands of a wide variety of applications. Beside the use as a standalone desktop or 2U panel-mount unit including analog and digital audio interfaces, as well as USB audio, the TM3-Primus series units with firmware version 1-02 or higher also provides the innovative USB hybrid function for direct access of audio signals from a DAW. 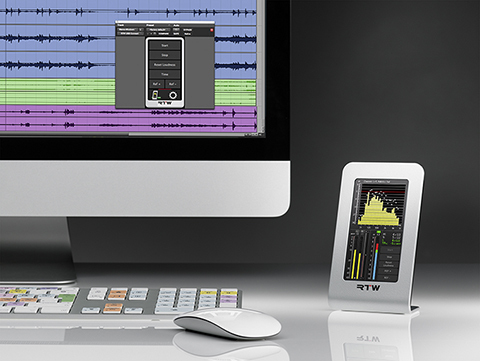 Metering will then be performed right from the DAW via RTW USB Connect software, and the TM3-Primus devices will process and visualize the information without the need for additional wiring or extensive signal routing, and without dropping the standard audio interface. The graphical user interface used in the units is controlled simply by using your finger. Instruments can be selected and will be combined for an optimized reading. All commonly used parameters are set, just a few need to be adjusted by the user to meet individual requirements. TP/PPM Bargraph, Moving Coil instruments, Loudness Sum bargraph, numerical display, Loudness Chart instrument, Loudness Range instrument (LRA), Audio Vectorscope, Real Time Analyzer, Correlator (phase meter), Monitoring instrument, and keyboard. Before using USB audio signals from a computer, TM3-Primus devices have to be defined as USB audio device for sound output (Mac® OS X) or as standard audio output device (Windows®). Information about that can be found in the TM3-Primus USB audio setup descriptions available at "Audio Monitors/TM3-Primus - Manuals" section of members area (Manuals & Software). On Windows® systems, RTW Primus USB audio driver has to be installed in any case. The driver is available at "Audio Monitors/TM3-Primus - Software" section of members area (Manuals & Software). Further details can be found on the "Instruments" tab or in the TM3-Primus data sheet (see "Download" tab). Loudness Sum and Loudness Num instruments for displaying the summed Loudness values M, S, or I of a Loudness measurement acc. to EBU R128, ITU BS.1770-3/1771-1, ARIB, ATSC A/85, OP-59, AGCOM oder CALM Act on a bargraph resp. on a numerical display. Loudness Range instrument in MagicLRA mode for a graphical representation of Loudness variances. The Monitoring instrument provides a monitoring controlfunction with onscreen level fader for monitoring of displayed signals and generates a downmix of a USB Surround signal for output via S/PDIF Out connector. Stereo Correlator instrument for displaying the phase relationship between the two channels of a stereo signal (mono compatibility). The keyboard includes selectable on-screen keys with defined control functions for several instruments. Plug-in and stand-alone application free of charge for simultaneously monitoring and metering with TM3-Primus devices (USB hybrid function) and for remote control of its Start/Stop/Reset functions. Plug-in operation for a direct audio connection between DAW and TM3-Primus via USB Connect. No need to define TM3-Primus as standard audio output device in the computer system. Remote control of start/stop/reset functions, time scale of Chart instrument, and reference of RTA of the directly connected TM3-Primus via plug-in.